String is One Of Those Things. It should be a nice well-behaved product which lives in a drawer and waits until it can be useful. However, any string which comes into this house seems to have a mind of its own. It doesn't stay in the drawer, preferring to go exploring all areas of the house and garden. What's more, like the fairy tale children leaving a trail of crumbs, string leaves a trail behind it as it unravels from its ball and goes out to play. I have been tempted by "things" to put string in but so far I have resisted little pots like this one. 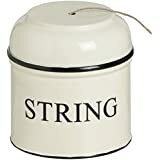 Spending £5.80 or even more would give my string even more ideas of its own importance. String is to be kept in its place in every sense of the phrase. Note for UK readers. Amazon has Sugru as a "Deal of the Day" for today only. That is very clever! I like yours better as well! I've never heard of sugru! Good idea to make your own holder. Love the tin, Mary. Are you going into production?